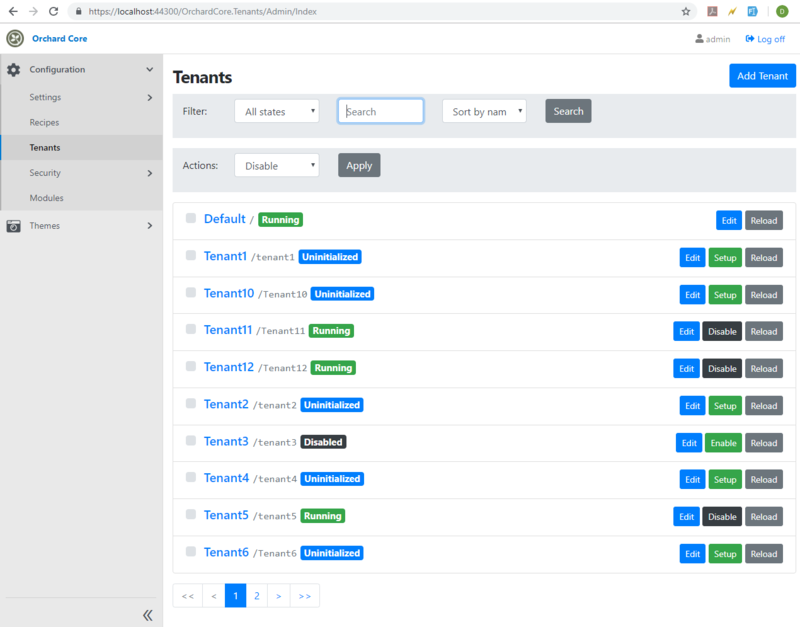 This week is about to improve the new Try Orchard Core, therefore new features added to Orchard Core to manage tenants. And of course, the Lombiq Orchard Visual Studio Extension got a huge update! There is a new endpoint "health/live", that returns different statutes based on the health of the system. This could be very useful when you run Orchard in multiple nodes. To test this feature don't forget to enable the Health Check module. 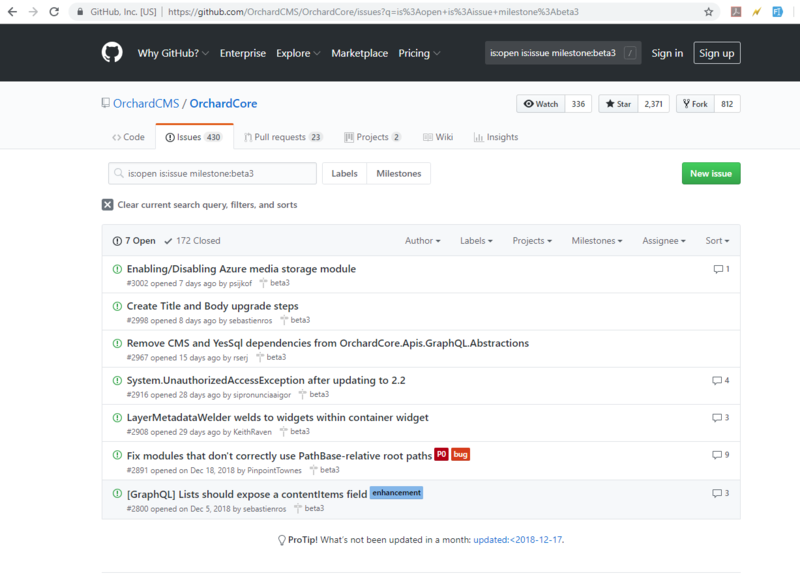 To see the open issues left for the Beta 3 release of Orchard Core, head to the GitHub repository of Orchard Core and search for the open issues labeled with the beta3 milestone. The way of managing the tenants are improved with many new features. Now you can filter the tenants by their states and names, and sort them by the name and the state. You have the ability to bulk enable/disable tenants. Pagination also added to this page when you have more than 10 tenants. In the following screen you can see we have the Default tenant and tenants with names Tenant1-Tenant12. You can see the added filters, actions and pagination. Try Orchard Core has a new URL https://try.orchardproject.net/ and has a slightly new index page. When you create a demo site you can see a thumbnail for the recipe instead of a list. 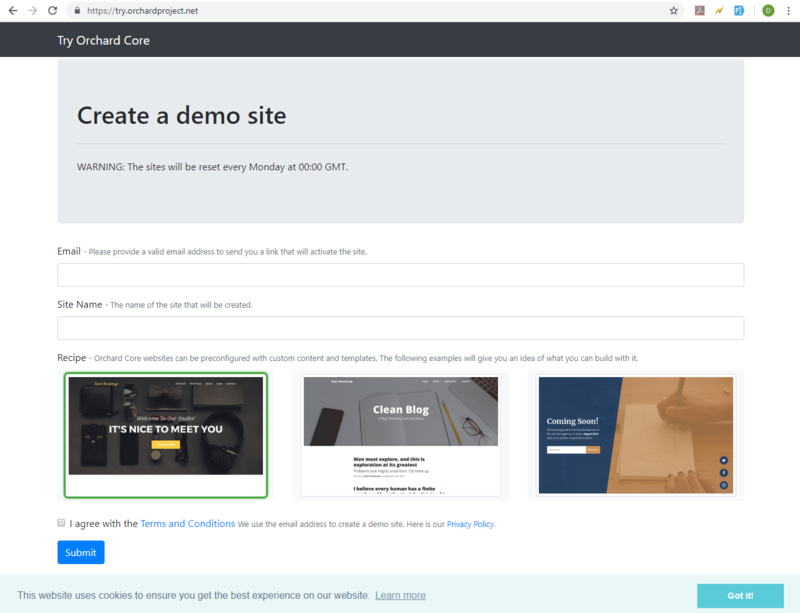 Another improvement is that the new demo site is only setup when you click on the "Setup your site by opening this link." link in the received email. This is a Visual Studio extension with many features and templates frequently used by Lombiq developers. Contains Orchard-related (including Orchard Core) as well as generic goodies. This extension has an Orchard Log Watcher feature, that alerts you when you have any new entry in the log file. When you install this extension, you will see a new button on the Orchard Log Watcher toolbar. The button of this toolbar will be enabled when you have unread entries in the error log files. If you click on this button, the log file will be opened with the editor assigned to open .log files. When you navigate to Tools -> Options -> Lombiq Orchard Visual Studio Extension -> Orchard Log Watcher you can enable or disable this feature. You can also set the log file folder path. The path can be anything, so, you can set custom paths as well. The default path here supports the default path of the log files in the case of an Orchard Core and an Orchard 1.x solution too. Another great feature of this extension is the dependency injector. First, select the Tools -> Inject dependency... option. When you start to type the name of the dependency that you want to inject, the autocomplete feature will suggest you from some of the most used dependency names. In the following screen we injected the IAuthorizer to an AdminController. At the bottom of the windows you can see a little preview about the new code, that will be added to your controller. You can generate short field name by ticking the Generate short field name checkbox. 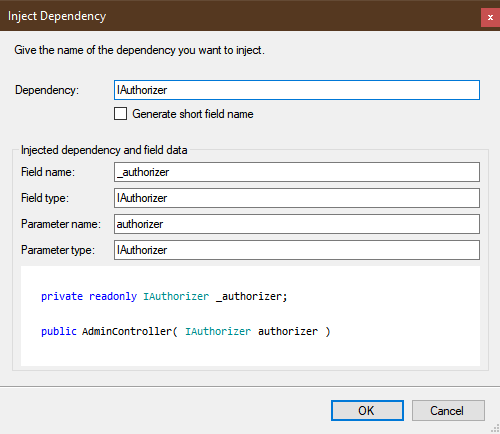 In this case the field and the parameter name will be consist of the uppercase letters of the dependency. 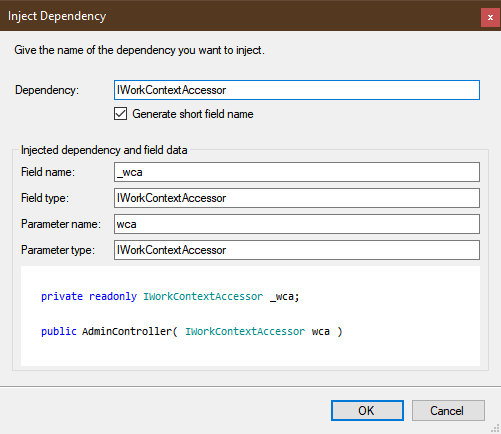 In the following example, the field and the parameter name will be _wca and wca for the IWorkContextAccessor. Here you can download this free, open source extension. In GitHub you can find the extension's Readme with release notes too. Also, if you encountered bugs or have a feature request please add it on the GitHub page as well.